Local condo prices skyrocketed even faster than single-family home costs or apartment rents in recent years, but now a shifting condo market is offering a welcome reprieve for fatigued buyers. 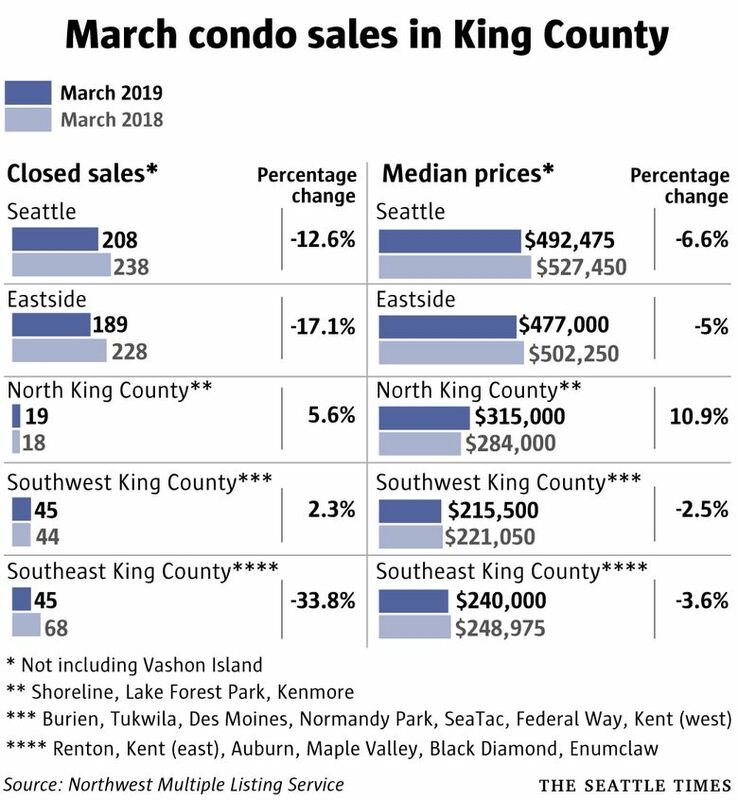 Across King County, condo shoppers have nearly three times as many units on sale to choose from than when the market peaked last year. They’re getting about six weeks on average to look around and complete their due diligence before buying a condo, up from just a single week in last year’s hectic market. Bidding wars have all but disappeared. The typical condo even now sells for below list price, which was unheard of in recent years. The annual dip in condo prices was the second biggest since the market bottomed out in 2012. The one time condo prices dropped more? That was just a month prior, when condo costs declined 8.4% year-over-year. It’s been quite the change. Flash back to spring 2018 and prices were soaring as much as 35% a year. “This is the first window of opportunity where buyers can take the reins a bit and work the sellers off their price,” said Windermere condo broker Jeff Reynolds, who runs the urbancondospaces.com blog. The new numbers also show single-family home prices declined 3%. Reynolds just helped Issaquah resident Raju Sayyaparaju and his daughter, Radha, buy a condo near her new job at Amazon. They found three identical two-bedroom condos for sale in the Insignia tower downtown and were able to get one for 10% off list price. The number of condos on the market countywide has soared 164% while sales have decreased 15% versus a year ago. A big reason is the uptick in new condo projects. 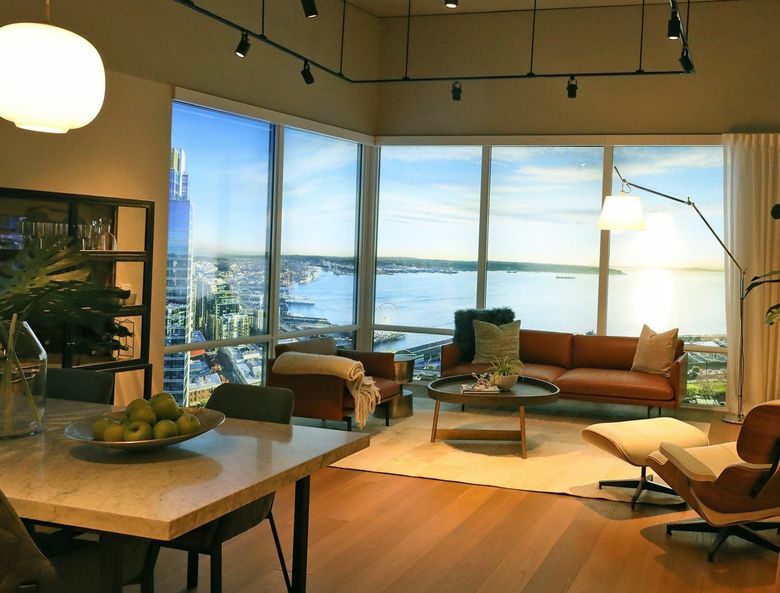 Most aren’t complete yet, but presale opportunities abound: Across Seattle and Bellevue, there are 1,400 brand-new current and future condos available and sitting unsold, up from just 100 at this point a year ago, according to the real-estate firm Polaris Pacific. Developers are building condos for the first time in over a decade largely because apartment rents have stopped soaring — making condo construction, by comparison, a more financially enticing prospect for developers building housing towers (although the vast majority of large housing projects remain apartments for rent, not condos for sale). And bipartisan condo-reform efforts advancing through the statehouse in Olympia this session, designed to relax state laws that make it easy for condo owners to sue developers, will likely entice more condo construction in future years. At The Emerald, a new condo tower rising in downtown, sales associates had to react when another nearby luxury condo under construction, First Light, offered buyers prizes, said Josh Nasvik, an executive at Polaris Pacific, which is selling The Emerald condos. The First Light gifts included a BMW lease or trips to London. 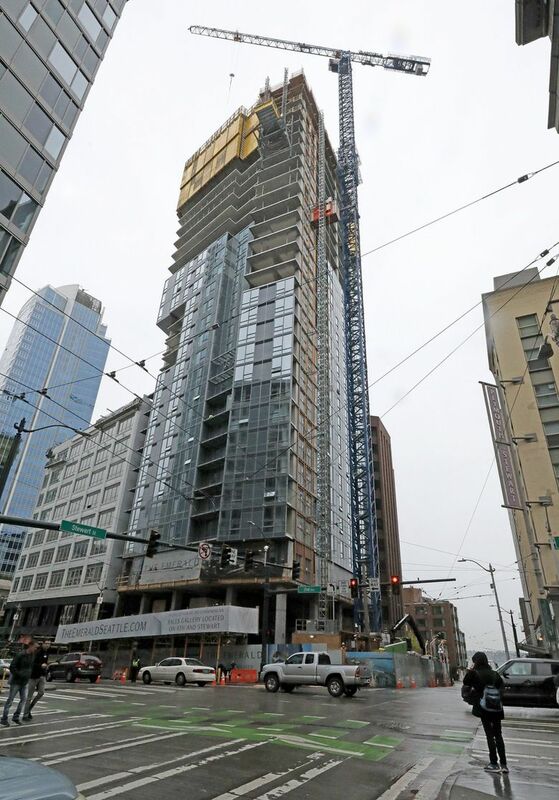 “The stories of buyers standing in line in the rain to get your condo are a couple years old at this point,” Nasvik said, referring to buyers who camped out overnight to secure condos in Denny Triangle’s posh Nexus in 2016, then the only new condo project on the market. Reservations for two-thirds of those units were snatched up immediately at the time; Nasvik said about 10% of condos at The Emerald have sold in the month since presales began. Of course, the shift in the market hasn’t suddenly made condos here affordable — even with the recent dip, prices countywide are still up 148% since bottoming out seven years ago, compared to increases of 102% for single-family homes and 59% for apartment rents in that span. In the Sayyaparajus’ case, that 10% discount off the list price meant they still had to pay $1.05 million for a two bedroom in the centrally located, luxury Insignia tower. Condos are generally cheaper than that across the board, though. The median price countywide is $434,000, or $492,000 in the city of Seattle. That’s still a more affordable option than single-family home prices, which in March reached $667,000 countywide, and $752,000 in Seattle. The monthly real-estate data released Friday by the Northwest Multiple Listing Service also provides the latest insight on cooling single-family-home prices. 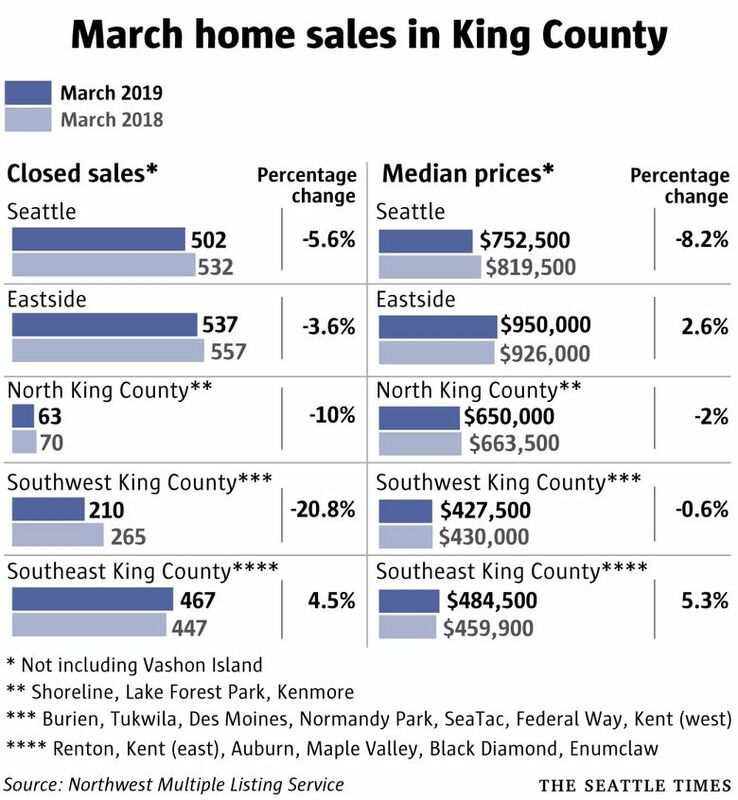 King County’s median single-family house sold for 3.2% less in March than a year prior — the biggest drop in seven years. Inventory nearly doubled in that span while prices again dropped. The price shift was led by an 8.2% annual decline in the city of Seattle. Prices were virtually flat in West Seattle and declined in every other neighborhood, led by year-over-year prices dips of 14.5% in Queen Anne-Magnolia, 10.6% in Southeast Seattle and 8.5% in the Ballard/Greenwood area. Prices also decreased a bit in the north and southwest parts of King County. But over on the Eastside, prices grew 2.6%, to $950,000. And in Southeast King County, prices grew 5.3%, to $484,400. Looking at the data a different way, house prices countywide did tick up nearly 2% compared to just a month prior, but that was half the normal seasonal increase seen this time of year as the market climbs out of the winter doldrums. That balances out the unusually large seasonal month-over-month bump seen in February, making the total winter-to-spring transition roughly average compared to years past. 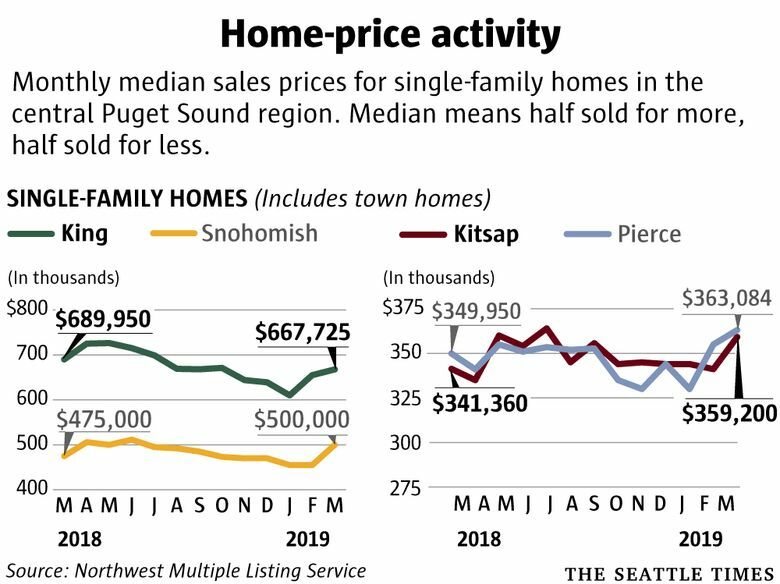 In Pierce County, single-family home costs increased 3.8% year-over-year to a new median sales price of $363,000 — setting a new record, beating the previous high set last May. In Snohomish County, home prices grew 5.3% in a year to $500,000. And in Kitsap County, home values went up 5.2% to $359,000. Snohomish, Kitsap and King county home prices are below their record highs reached last spring and summer. This story has been updated to correct the photo caption. The condo project is The Emerald, while Polaris Pacific is the firm marketing it. The aim was to create affordable housing on the Eastside. But some owners had other homes.